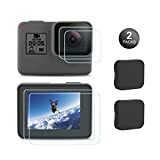 ★Upgraded quality and professional design, fully fit for GoPro Hero 7 Black ONLY (NOT for Hero 7 White or Silver Edition) / Hero 6 / Hero 5 / GoPro Hero HD (2018) only. ★Upgraded tempered glass screen protector (screen & lens): Longer tempering time, which made the screen protector has a higher hardness. It would protect your camera screen and lens from scratches, dust, oil, fingerprints resist effectively. ★Highest definition and sensitivity: High-quality material and only 0.3mm thickness, extremely thin to bring you a high permeable and crystal viewing experience with ultra-low reflection and won't reduce the sensitivity. ★Lens cover: Made of TPC waterproof material, which will give a great protection for the lens and avoiding dirty, dust and scratches. ★Easy to remove without residue by the use of cleaning tools contained, remaining your camera brand-new. When fixed on the screen, it is nearly automatic.